Internet-based companies took a second hit in less than two weeks when the Supreme Court of the United States ruled today that states can collect sales tax from marketers and retailers that do not have a physical presence in that jurisdiction. 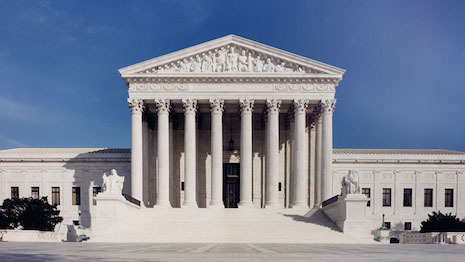 In a 5-4 judgment where Chief Justice John Roberts sided with the dissenting minority, the court ruled that states can collect taxes from companies as long as they have customers from their jurisdiction and in the same manner as they collect taxes from local stores. The case was filed by South Dakota against Internet and mobile retailer Wayfair Inc.
“The physical presence rule has long been criticized as giving out-of-state sellers an advantage,” the Supreme Court judgment said. The Internet’s prevalence and power have changed the dynamics of the national economy, the majority-ruling judgment delivered by Justice Anthony Kennedy said. In 1992, mail-order sales in the U. S. totaled $180 billion. Last year, ecommerce retail sales alone were estimated at $453.5 billion. The ruling will affect all luxury retailers and marketers that sell online and via mobile to customers in U.S. states even where they do not have bricks-and-mortar stores or warehouses. Categories affected include leather goods and accessories, fashion apparel, watches and jewelry, art, automotive, food and beverages, consumer electronics, home furnishings, fragrance and personal care, and overall retail. All ecommerce and mobile commerce transactions will eventually be charged sales tax by states emboldened by the Supreme Court ruling to expand their own taxation powers over remote sales to their state residents. The June 21 Supreme Court judgment overturns the 26-year-old Quill Corp. vs. North Dakota ruling that exempted direct marketers, catalogers and online-only retailers without physical nexus in that state from paying sales tax there. The Quill ruling requiring physical nexus within a state to collect sales taxes largely benefited now-Internet giants such as Amazon and eBay. Amazon now is among the Fortune 10 companies with revenue last year of $174 billion and within striking distance this year of reaching or crossing $200 billion in sales. What this means in simple terms is that online- and mobile-only retailers are liable for sales taxes should the states insist upon them being paid if customers residing there make the purchases. With this ruling, the Supreme Court upheld a 2016 South Dakota law that requires online merchants with more than $100,000 in annual sales to state residents, or 200 transactions with state residents, to collect sales tax, the National Retail Federation pointed out. “Retailers have been waiting for this day for more than two decades,” Matthew Shay, president/CEO of the National Retail Federation, Washington, said in a statement. “The retail industry is changing, and the Supreme Court has acted correctly in recognizing that it’s time for outdated sales tax policies to change as well,” he said. “This ruling clears the way for a fair and level playing field where all retailers compete under the same sales tax rules whether they sell merchandise online, in-store or both,” the National Retail Federation’s Mr. Shay said in the statement. The ruling comes 10 days after Net Neutrality – a concept where all Internet traffic is treated equally, and not charged on a differential basis by Internet and mobile service providers – was declared dead by the U.S. Federal Communications Commission. That change, called the “FCC’s Restoring Internet Freedom Order,” after many years will result in raised delivery costs for both Internet users and those who produce content that needs to be carried over pipes and airwaves. Meanwhile, the sales-tax collection decision delighted the National Retail Federation and all retailers with a bricks-and-mortar presence that have consistently argued for a level-playing field with ecommerce players and retailers with a limited footprint that did not charge their customers the sales tax for the state from where they made the purchase. For their part, the 45 U.S. states that have sales tax argue that retailers that shield themselves behind lack of physical nexus deprive the jurisdictions of revenue to support civic services at municipal and state levels. What this decision will spur is a rush by states to deploy legislation to collect sales taxes from all remote sales where the buying customer resides in their tax jurisdiction. THE U.S. HAS more than 10,000 tax jurisdictions, so collection of sales taxes will not be straightforward. That prospect does not daunt the nation’s leading retail lobby.